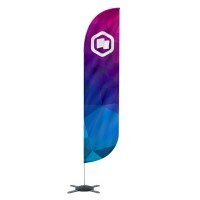 Standard Feather Beach FlagThe most popular shape in our range of standard beach flags. 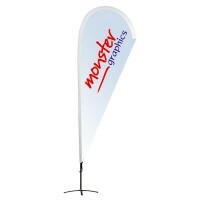 The bottom o..
Get noticed with your very own outdoor advertising printed curved portable flag right here at Monste..
Standard Crest Beach FlagWith a symmetrical curvilinear shape crest flags have an elegant appearance.. 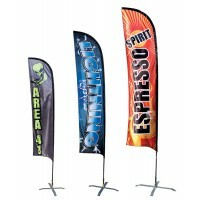 Promotional Event Advertising Flags Would you like to promote your organisation outdoors? 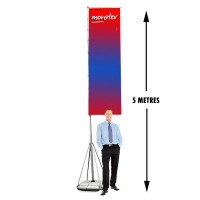 A pro..
Our Giant Monster 5 metre high Wind Dancer Portable Outdoor Flag is designed to make a huge impressi..
Standard Quill FlagSometimes known as teardrop flags and with a shape that allows for a large area a.. Stage backdrops, theatrical cloths, scenery backgrounds, band backdrops, entertainers’ banners, festival backdrops, photography backdrops, wedding reception backdrops, DJ banners, lightweight banners for pubs, clubs and bars. All our fabrics are fire retardant and may be used indoors with confidence. Tension frame graphics and systems, backlit fabric graphics, freestanding textile graphics, satin banners, ceiling hanging graphics, kakemonos, bespoke wallcovering. Fabric pop up stands, hop up advertising walls, modular fabric graphic systems, fabric lightboxes, printed fabric upholsterers foam cubes. Outdoor flags, corporate flags, beach flags and portable systems, feather flags, teardrop flags, quill flags, double sided freestanding fabric flags, crowd control barrier skins, bespoke tablecloths for trade fairs, food fairs, farmers markets etc. Deckchairs, bespoke printed sit-on foam cubes with removable cover, directors chairs, bean bags, printed cushions. Custom printed advertising and promotional banners, flags and theatrical stage backdrops for bands and theatre productions. We are banner printing experts based in Thanet, Kent. First choice for banner printing in Thanet for PVC advertising promo banners, roller banners and feather flags. Inexpensive, high quality banner printing, whether you are looking for a pull-up/roller-banner, exhibition stand, theatrical backdrop or feather flags, we are sure we can help you. We provide a 4 working day delivery to addresses in the UK, plus an express option for a delivery within 48 hours. Whatever your banner printing requirements, we can help and at a great price. 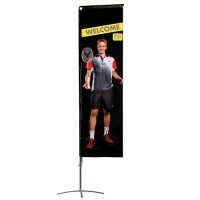 Soft Sign Banners Kent provide everything you need to get your own custom flags, promo banners and theatre backdrops manufactured. Our products come in an unlimited range of sizes that are made from PVC, PVC mesh, recyclable plastic or polyester textile fabrics. If you are looking for a highly visible cost-effective way of promoting your business, theatre show, production, band or event, our advertising banners, roller-banners, backdrops and flags are the perfect solution and you will find exactly what you need right here at Soft Sign Banners, Kent. If you have a question, please contact us and we will be happy to help. Bespoke printed vinyl or fabric advertising banners are the ideal way to promote any business, event, band, show, exhibition or theatre production. Soft Sign Banners, Kent supply one-off full colour banners/roller banners, flags and stage back-drops, custom printed with your own designs and images from as little as £25 (ex VAT). 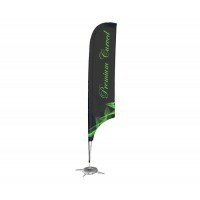 Flags and quills are large free-standing advertisements that are sure to make a big impact and create a buzz at any event.